Originally designed to create improvements to electromechanical relays and vacuum tubes in telephone switching equipment, Bell Labs holds a press conference in New York to publicly demonstrate the first point-contact transistor. The transistor represents a significant advance in technology. As it is developed over the next few years, it will become the successor to the vacuum tube, the primary method of controlling electronic circuitry at the time. 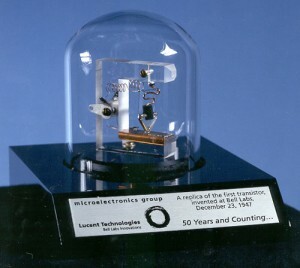 The use of transistors allows the development of the integrated circuit and microchips which kickstarted the rapid advance of electronic and computerized technology over the last 60 years. Every industry that utilizes technology, from communications to computers to space travel to video games to media, owes a great deal to the development of the transistor.